Interstate 84 East to Exit 17. At the end of the exit ramp, turn left on to route 63 North. 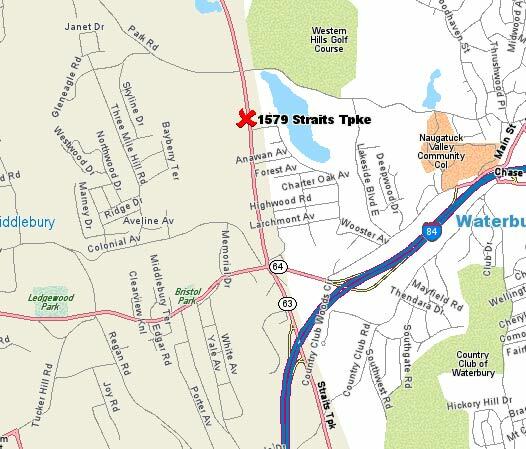 Travel 1.2 miles and turn left into 1579 Straits Turnpike (Turnpike Office Park). Enter building through the glass archway and take elevator to lower level. Interstate 84 West to Exit 17. At the first light turn right onto route 63 North. Travel 0.7 miles and turn left into 1579 Straits Turnpike (Turnpike Office Park). Enter building through the glass archway and take elevator to lower level. Route 8 North. Merge onto Interstate 84 West (Exit 33). Take Interstate 84 West to Exit 17. At the first light turn right onto route 63 North. Travel 0.7 miles and turn left into 1579 Straits Turnpike (Turnpike Office Park). Enter building through the glass archway and take elevator to lower level.